Well, I've been so busy getting the new store ready I've not had time to even think about a Tablescape. So I'm asking you to revisit my first tablescape attempt here. In the mean time I'm working like mad to get everything ready for opening day this Saturday! I have learned that this Saturday in conjunction with the National Hod Rod Association event held at the fairground, our local business merchant group will be shuttling 300-400 shoppers into Middletown. Well, I don't know if I'll have it all ready for such a large group, but you can only do what you can do right? That's my mantra for the week at least. Thanks for coming by to visit! 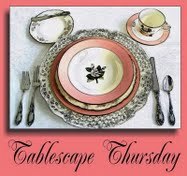 Please visit other tablescapes at Susan's Between Naps on the Porch site. I love your blue and white with a touch of orange! You've been doing this tablescaping for a year now. Congrats, and best wishes with your new business. Congrats on your store opening ... may all success come your way loaded with moo-la! Loved your re-visit -- good luck with your new venture! I know where Taylorsville is! Hello from Cincinnati. We go for long rides on weekends to Glendale... Bardstown....Lexington...it's not so far. Now that we know where we are in blogland let's not be strangers!